Abu Dhabi: The fantastic capital of the United Arab Emirates and the second most populous city. With its overwhelming skyline of towering buildings tailored to intricately modern architectural designs, Abu Dhabi is the hot spot for private luxury yacht charters. Enjoy the fruits of its innovative landscapes while indulging in traditional Arabian customs and the city’s exquisite cuisines. You’ll quickly come to find that Abu Dhabi is the place to see, and what better way to navigate this impressively packed island than on a luxury yacht charter? After all, Abu Dhabi is the place of peak luxury, and your luxury superyacht can compliment your trip into the capital in every way. 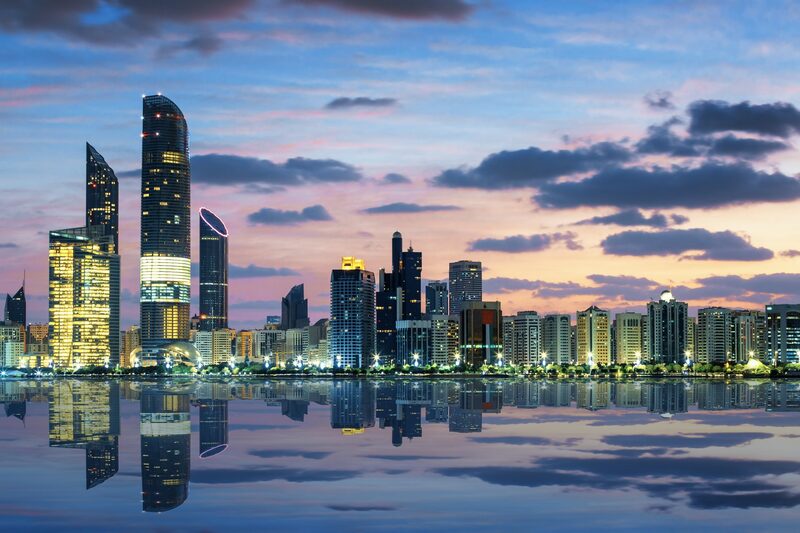 Relax or party, Abu Dhabi truly has it all. It’s a choose your own vacation, and the more you know about what this amazingly diverse city has to offer, the more you can enjoy it. Your luxury charter awaits you in one of the most popular charter destinations in the world. It’s Abu Dhabi, and like your superyacht charter, it’s here to cater to you. It makes perfect sense to travel in luxury to an elite city, which is what makes Abu Dhabi a popular private charter yacht destination. Being the second most populated city in the United Arab Emirates, you’ll never be short on things to do, see, and eat. Splash in Abu Dhabi’s blue seas, indulge in the city’s fresh food and produce, a salute to its trading past. Don’t pass up an authentic dish with lamb, chicken, or both, doused in traditional spices and sauces with aromas irresistible to passersby. Linger on the Corniche, a free beach settled in Abu Dhabi’s remarkably gorgeous waters with the city standing behind it. Spend your evening taking a sunset cruise (that is, if you don’t find yourself being pulled back to your amazing luxury yacht charter) on an expansive catamaran with Belevari Marine to witness the gem of Arabia: its sunset. As you find yourself at Emirates Palace Marina, walk around its glorious hotel. Once you have delved into the foods of Abu Dhabi, you may find yourself altering your meal plan aboard your own luxury yacht charter. International cuisine reigns supreme in Abu Dhabi, so much so that you’ll find that the entire city has an inclusive and worldly palette, which is good news if you love refined cuisine. Try harees, a simple, traditional dish created from wheat, chicken, and salt, whose long cook-time makes this a worth-the-wait local treat. Machboos (also called majboos or makboos) is just as uncomplicated, serving you meat and rice, topped with a mixture of spices, so tantalizing, you’ll be getting seconds. And don’t end your yacht charter to Abu Dhabi without dessert—luqaimat, which is frighteningly addictive fried dough with delectably sugary date syrup. Let this breathtakingly modern Islamic city welcome you with their commitment to hospitality and inclusion. Impressive, towering buildings make up the city’s unmistakable skyline like the collection of Etihad Towers, which beckons tourists worldwide. Visit the Sheikh Zayed Grand Mosque, Abu Dhabi’s iconic landmark comprised of its architectural marvel—a collection of 82 white domes that stands as a remarkable site to witness. Behold its unbelievable crystal chandeliers as they sparkle on the Grand Mosque’s high ceilings and see for yourself the fantastically plush Persian carpet that lines the main prayer hall—the largest carpet in the world. Make a trip to Emirates Palace—you won’t regret it. This five star hotel in Abu Dhabi is as extravagant as your superyacht. Opened in 2005, the Emirates Palace combines traditional Islamic architecture with ultra-opulence, leaning on elements of geometry and balance to perpetuate its overarching theme of a unified whole. If you’re feeling cultural, pencil in a visit to Louvre Abu Dhabi, an art and civilization museum that lives up to its name. It’s brand new, established in 2017, and like the rest of Abu Dhabi, delves into outstanding architectural design (after all, it is an art museum). The museum is actually part of a thirty-year agreement between Abu Dhabi and the French government, a true reflection two vastly different cultures coming together to create something extraordinary, which begs the question: would you like to be a part of it? You’ll find even more things to do in Abu Dhabi when you consider stopping at Abu Dhabi’s Yas Island. Yes, Abu Dhabi has an island within its own, and the crafted piece of land mass spans over 6,000 acres. As you can imagine, Yas Island has much to offer its tourists and is worth your time to see it during your luxury yacht charter. On Yas Island, take a moment to dabble at its beach, or excite yourself at the Marina Circuit or the Island’s very own Ferrari World. If you’ve brought your family, start your day at Yas Island’s Yas Waterworld, or for the movie-inclined, Warner Brothers World Abu Dhabi. And lest you forget about SeaWorld Abu Dhabi, or if you’re feeling homesick, stop by the Island’s Ikea. Looking for Abu Dhabi’s night scene? You don’t have to go too far. Abu Dhabi is filled to the brim with cocktails, hotel hot spots, dancing, and endless happy hours. The city caters to your every whim, and with its bursting population mixed with wealthy residents and wealthier tourists, does not disappoint. You won’t wander for long, as practically every hotel touts their best for passersby, each one more popular than the next. Opt for a more laid back vacation by hanging out in Abu Dhabi’s warm weather at Saadiyat Island and its new public beach—you won’t be disappointed, as Abu Dhabi’s public beaches are far more extravagant than most. Then, take a stroll to the fish market at Mina Port, if you’re feeling curious about local cuisine, and have your fishy purchase authentically fried up. An armada of superyachts heads to Abu Dhabi each year to enjoy the glitz and glamour of this beautiful location, as well as the Middle Eastern culture that still thrives here. The smells of a bustling souk at Central Market and the call to prayer at the Sheikh Zayed Grand Mosque bring a real buzz to this great city. Book your next Abu Dhabi yacht charter with Perfect Yacht Charter.